Summary: A new study reports transcranial magnetic stimulation can significantly reduce phantom limb pain. PLP is a neuropathic condition manifested by pain felt as a result of a patient’s enduring psychological perception of the amputated limb, and it occurs in up to 87 percent of amputation cases. “Phantom limb pain is a very challenging condition for its negative impact on quality of life and lack of treatment response, especially in those with traumatic related amputations,” said co-author Ronald G. Garcia, M.D., Ph.D at Massachusetts General Hospital and Harvard Medical School. Previous reports have suggested there are analgesic benefits of rTMS for people with PLP. NeuroscienceNews.com image is credited to ashlandhumanbio. “In our current study, results showed that treatment with rTMS for two weeks induced a clinically significant pain reduction in 70 percent of traumatic amputees with phantom limb pain up to 15 days after treatment with no serious side effects,” said Dr. Garcia. Image Source: This NeuroscienceNews.com image is credited to ashlandhumanbio. American Pain Society. “Brain Stimulation Technique Shown Effective in Phantom Limb Pain.” NeuroscienceNews. NeuroscienceNews, 11 August 2016. American Pain Society. 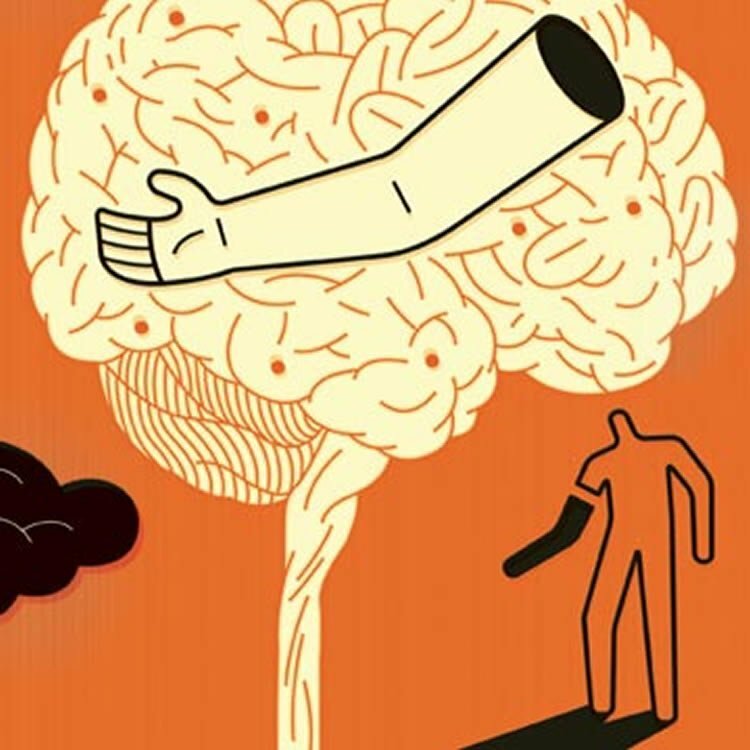 “Brain Stimulation Technique Shown Effective in Phantom Limb Pain.” http://neurosciencenews.com/phantom-limb-pain-tms-4830/ (accessed August 11, 2016). We evaluated the effects of repetitive transcranial magnetic stimulation (rTMS) in the treatment of phantom limb pain (PLP) in land mine victims. Fifty-four patients with PLP were enrolled in a randomized, double-blinded, placebo-controlled, parallel group single-center trial. The intervention consisted of real or sham rTMS of M1 contralateral to the amputated leg. rTMS was given in series of 20 trains of 6-second duration (54-second intertrain, intensity 90% of motor threshold) at a stimulation rate of 10 Hz (1,200 pulses), 20 minutes per day, during 10 days. For the control group, a sham coil was used. The administration of active rTMS induced a significantly greater reduction in pain intensity (visual analogue scale scores) 15 days after treatment compared with sham stimulation (−53.38 ± 53.12% vs −22.93 ± 57.16%; mean between-group difference = 30.44%, 95% confidence interval, .30–60.58; P = .03). This effect was not significant 30 days after treatment. In addition, 19 subjects (70.3%) attained a clinically significant pain reduction (>30%) in the active group compared with 11 in the sham group (40.7%) 15 days after treatment (P = .03). The administration of 10 Hz rTMS on the contralateral primary motor cortex for 2 weeks in traumatic amputees with PLP induced significant clinical improvement in pain. High-frequency rTMS on the contralateral primary motor cortex of traumatic amputees induced a clinically significant pain reduction up to 15 days after treatment without any major secondary effect. These results indicate that rTMS is a safe and effective therapy in patients with PLP caused by land mine explosions.